There are many privileges and responsibilities connected with Brandeis’ position as a first-tier university. Perhaps none is more profound than this: We are, and always have been, a gatekeeper to the American dream. I often say we are in the business of changing the arc of young people’s lives, and that this is a sacred task. Nowhere is this task more apparent than in the Brandeis Transitional Year Program (TYP), a one-year academic program for students who have not had access at home or in school to resources that prepare them for a rigorous four-year undergraduate experience. At Brandeis, we believe — and, indeed, have proven — that helping individual students succeed in higher education changes our world for the better. Given the size of the Brandeis student body, this effort may seem like a drop in a very large bucket. Yet I can assure you the ultimate impact on these students — and society — is no small thing. Each year, 20 outstanding students are selected from a pool of more than 200 applicants. These students, who have not had access to AP or honors courses, come to Brandeis after high school for a transitional year that provides small classes and strong support systems to help them apply focus, energy, perseverance and maturity to their university experience. One-fifth of these students have attended more than one high school, and three-quarters are the first in their family to attend college. Last year, half came from high schools that send fewer than 50 percent of their students to four-year colleges. Despite these gloomy numbers, 90 percent of TYP students complete the program, and of those who matriculate at Brandeis, 85 percent graduate. The creation of the TYP program in 1968 is a fabled part of Brandeis history. TYP was envisioned and launched by the Brandeis faculty in the aftermath of the tragic assassination of Dr. Martin Luther King Jr. I am reminded of George Bernard Shaw’s famous dictum, “You see things; and you say, ‘Why?’ But I dream things that never were; and I say, ‘Why not?’” Since 1968, more than 1,100 students have completed the TYP program. Taken together, these individual cases add up to a tremendous impact on lives, careers and, ultimately, our communities. In June, TYP was renamed the Myra Kraft Transitional Year Program, in memory of the late Myra Kraft ’64. A $5 million gift from Robert Kraft and his family will build on the program’s successful track record to ensure that — one student at a time — Brandeis continues to make a difference in people’s lives. Linking the TYP program with Myra is particularly fitting because TYP’s goals and her lifelong values are so closely aligned. She deeply believed that young people with motivation, determination and focus should not be held back because they lack opportunity. She loved helping people unlock their inner potential — and seeing it in action. It is difficult to imagine a greater expression of social justice, or a greater legacy for someone who spent her life focused on the “power of one” to change the world for the better — one person at a time. TYP students enrich our campus, then go on to successful careers that strengthen the institutions they serve and the communities they live in. 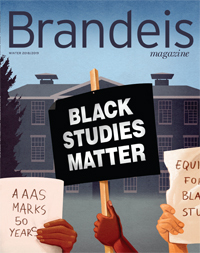 Their education is an investment in Brandeis, in the American dream of strength in diversity, and in the belief that individual opportunity is the foundation of social justice. Changing the arc of young people’s lives for the better allows us to participate in the essential responsibility of repairing the world.